Need a tee that does it all and still looks good? 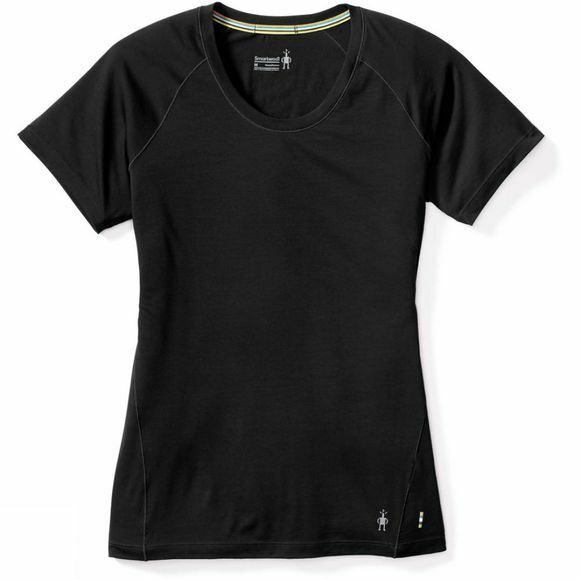 The Womens Merino 150 Baselayer Short Sleeve from Smartwool works undercover as a baselayer on cool mornings or as a stand-alone piece during warmer temps. Featuring Core Spun technology, we’ve wrapped Merino around a nylon core for added durability while still keeping the temperature regulation and moisture management benefits of ultra-soft Merino next to skin. Raglan sleeves remove shoulder seams for comfort under a pack and smooth merrow stitching wraps from side to front for a flattering look. SmartWool use high quality Merino wool in all of their products. This gives them the comfort, performance and durability that you need from your socks; which means you are free to enjoy the journey and move with luxurious comfort. The great thing about Merino wool is that nature has given it all the qualities you want from an outdoor material. It’s both warm and breathable, giving it exceptional performance as well as being both hardwearing and yet incredibly soft against even the most sensitive skin.